You'll be inspired to fill your sketchbook with descriptive pen lines and textures. 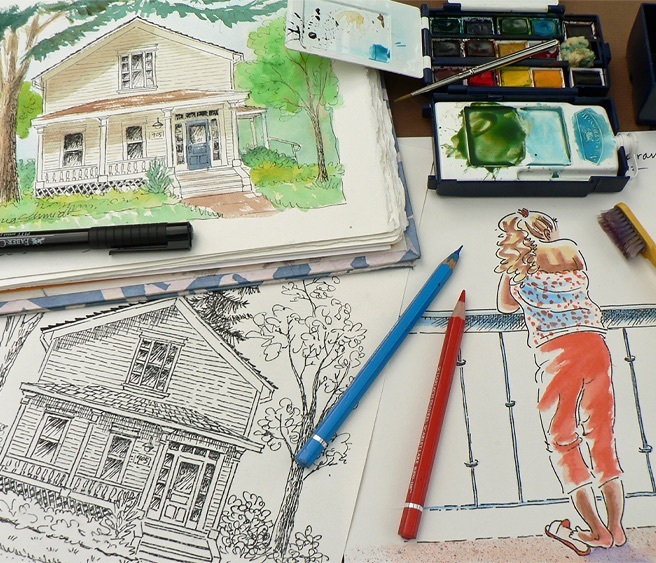 Participants will learn how to draw a house with black ink pen lines and texture as well as how to draw trees, shrubs and flowers in a step-by-step class exercise. In the next class exercise, participants will learn how to use watercolor pencils to add color to a figure with step-by-step instruction. There will also be time to sketch in the studio or outdoors on the beautiful Sitka grounds. For inspiration, I'll give tips and show many ink pen and watercolor pencil examples. Patricia has been painting for over 30 years. She is a Signature member of the Northwest Watercolor Society, a member of the Watercolor Society of Oregon, the Colored Pencil Society of America and SPLASH, a professional artist group. Her paintings are published in Splash Retrospective: 20 Years of Watercolor Excellence (2013), Splash 14 (2013), Splash 12 (2011) and the Watercolor magazine (2005). She has taught watercolor and colored pencil classes as adjunct faculty for several colleges as well as in workshops in Corvallis and Lake Oswego, Oregon. Her artwork can be seen at the Portland Art Museum’s Rental Sales Gallery. • Watercolors: Bring your favorite watercolors and mixing palette.